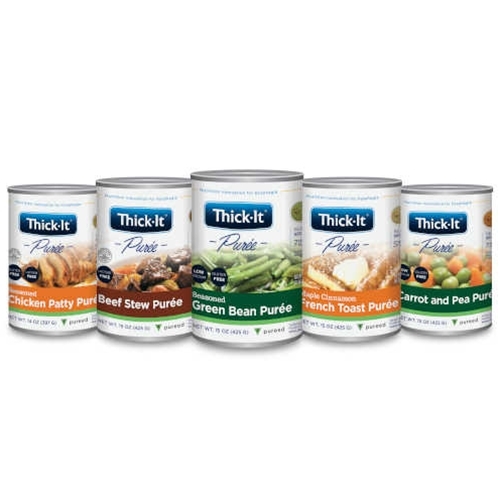 Thick-It Purees from HealthyKin.com are a new line of great-tasting pureed foods designed with your needs in mind—just open, heat and serve. Choose from several delicious, nutritious favorites, like Beef Stew Puree, Sweet Corn Puree and Maple Cinnamon French Toast Puree. Great, mom has Alzheimer's and it's a big help! This is easy to serve and taste good. I feel comfortable serving this to my family member. Great consistency and taste. The corn has some skin in it which is soft but could be a problem for some people. It's creamy and good. My eight yr old loves it!